Great Brehat on the Northern Peninsula of Newfoundland. Besides doing more 'office' work today - we did head to St Anthony in the morning. Our intention was to hire a small boat to capture more images of icebergs in Iceberg Alley, however 'Hughie' the weather god, was not on our side today. The thought of heading out into the big, chilly old Atlantic Ocean in high winds, in a boat not much larger than a 'Mini Coup' did little to excite us! In the end, we settled for a safer option, debatably a warmer option, to head over to Flat Point Lookout in the town of Great Brehat. We had a lead that there was a large iceberg which featured an arch sitting just off shore from Great Brehat and we'd be able to see it clearly from the lookout at Flat Point. So we hurried over, then climbed the steps, and sure enough there it was. 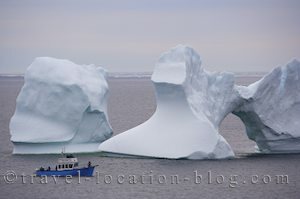 We'd spent about 20 minutes photographing the iceberg when the Gaffer III from Northland Discovery Boat Tours came into sight, and proceeded to circle the iceberg several times for their passengers. The size of the iceberg compared to the 48 passenger (42 foot) Gaffer III gives a good impression of just how big these massive chunks of ice can be. Soon enough the cool air ushered us back to the car park and into the warmth of the car and we headed back to Main Brook.